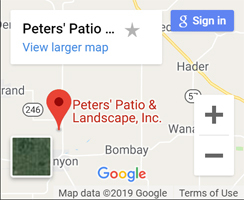 Peters’ Patio & Landscape, Inc. is a family owned and operated Kenyon Landscaping Company. We are located just North of Kenyon, MN. Some of the communities we have done business in are Rochester, Lakeville, Northfield, Faribault, Owatonna, Byron, Hastings, Eagan, Apple Valley, and Oronoco. We are ready for any job from planting a single tree to a complete landscape installation. Our company has a very knowledgeable staff and we have many years of experience. Darren has an A.A.S. degree in Landscape Horticulture from Dakota County Technical College. 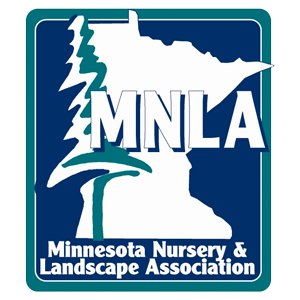 Peters’ Patio & Landscape is a proud member of the Minnesota Nursery Landscape Association. MNLA members are committed to professional improvement for their employees through continuing education, certification programs, and industry networking activities. MNLA is the region’s oldest and largest horticultural trade association. The mission of the Minnesota Nursery & Landscape Association is to help members grow successful businesses. We look forward to the possible privilege of serving you with your landscape design, installation, and maintenance needs. Contact Us today and lets discuss your next landscaping project. We got some of our project pictures used in the new Willow Creek Concrete Products Catalog!!! The process for each of our projects starts with an initial meeting. During that meeting we discuss what you are looking for in your project and get an idea what you have for a budget. We will also take measurements, pictures, and look at any other factors that may impact the design. We then go back with all of the information we collected from the meeting and start designing your landscape. We select all the materials that we think will work best for your project. The next step is to present the design to you and make any changes that you want. The proposal will also be presented to you along with samples of the various materials. This is also the time to ask any questions that you may have. We will also get you on our schedule at this time. Installation is the next step. You will get a phone call several days in advance letting you know for sure when we will be starting your project. We take pride in our work and pay attention to even the smallest details while working efficiently so you can enjoy your new landscape as soon as possible. During the installation process we will also keep the jobsite clean and organized throughout the duration of the project. © 2019 Peters' Patio & Landscape, Inc. All rights reserved.